Choose Villa Baciocchi in Capannoli for your most important events means living a fairytale experience where the wishes come true. The historical atmosphere and charm, the care for each detail, the attention to every need, the availability and cordiality of our staff: this is Villa Baciocchi. 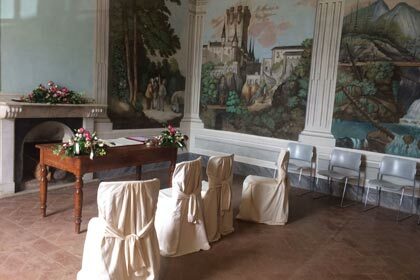 Villa Baciocchi and its park is the perfect location for civil weddings when, in 2015, the Municipal Administration has decided to include Villa Baciocchi as one of the spaces suitable for civil ceremonies. Located in the historical center of Capannoli, in Valdera, Villa Baciocchi permits to satisfy all the requests, by providing the different areas of the villa and the park: from the imposing secular park to the great Nobile hall (at the first floor), to the intimate Frescoes Hall. Moreover, we should not forget the strategic position of the Villa, easily accessible from the major cities such as Pisa, Pontedera and Volterra. Villa Baciocchi is the ideal place to experience a fairytale wedding in Tuscany, having available the whole structure, as well as the possibility for all the guests to visit the Museum. 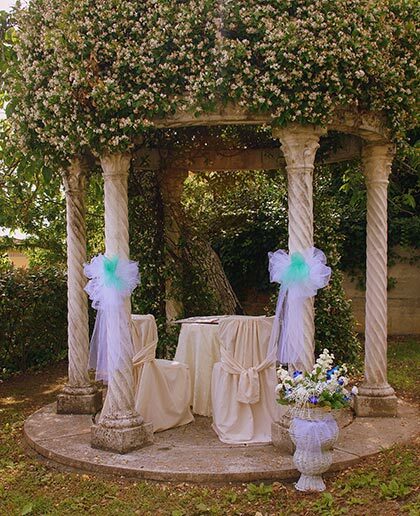 In the municipal territory, exactly in the Capannoli hamlet Santo Pietro Belvedere, there are the lovely ‘Lovers Gazebo’, completely covered by jasmine during spring time; and Castellina Park, both available for civil weddings. For information on how get married in the Villa, you can check the municipal website or email to the Civil status registry.